Review written by and copyright: Rick Curzon (17th March 2018). Joel Fleischman is a nebbishy Jewish doctor from New York City, and a fresh faced medical school graduate. He's also about to begin the four year service contract he promised to the state of Alaska, who financed his education. But he just happened to forget reading some of the stipulations in his contract, that has assigned him to the small post of Cicely, Alaska. A town of 215 people that welcomes it's newest resident with open arms. As he contends with the daily lives and rituals of these all too normal and trusting folk, Joel just might realise that Cicely's quieter ways are probably more civilised than the hustle and bustle of Manhattan. Made up of Cicely's various residents, patients and friends of Fleischman include wealthy former astronaut Maurice Minnifield; feisty pilot Maggie O'Connell; mayor and saloon owner Holling Vincoeur; his sweet, naive waitress girlfriend Shelly Tambo (who's old enough to be his daughter); intellectual ex-con and disc jockey Chris Stevens; Joel's far wiser and very quiet receptionist Marilyn Whirlwind; kindly store owner Ruth-Anne Miller, and avid film buff Ed Chigliak. Enjoy once again, now fully restored and in hi-definition, all 110 episodes, over 6 seasons, with all the original music as you remember it. I’d like to think that this quirky comedy-drama series from the early 1990s being made on 35mm film was post-produced in that format (a rarity if it was) or it’s had a complete rebuild in HD from the original raw elements. An explanation is needed for the not so technically minded reader; most US TV from the time was shot on 35mm film and then transferred to NTSC video tape for the assembly of the final edit and therefore the available broadcast masters are locked not only into standard definition but also on old masters dating from the time of production. By today’s standards those ‘90s masters look old, soft and dull. 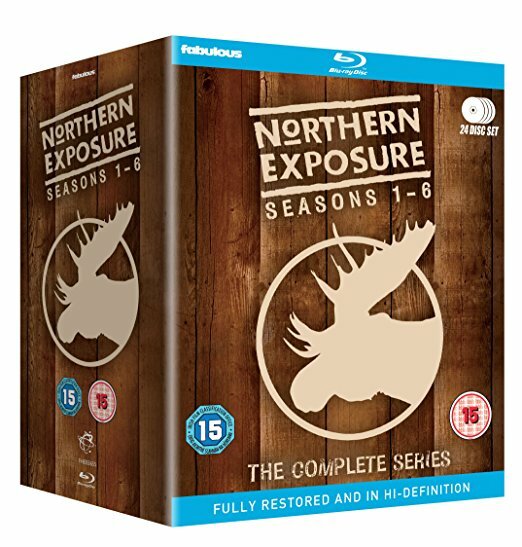 This is why I hope it was completed on film back in the day ala Twin Peaks because I suspect that Northern Exposure was redone in HD at some point in the early 2000s for the old DVD sets and those same masters are being used here for the Blu-ray in 2018. This has been the case for all of the other US Universal TV series released on Blu-ray by Fabulous Films in the last few years (The Incredible Hulk, The A-Team, Knight Rider, Miami Vice, Magnum PI and Quantum Leap). Despite there being some issues with those other sets the basic image quality was generally very strong and taken from Universals early 2000s masters and although they weren’t as good as they’d have been taken from new 2K or 4K masters they looked pretty damn sweet for the most part with seemingly decent encodes. Sadly, Northern Exposure has not fared as well. The image is soft and lacking in detail with closeups and fabrics not as sharp as they could be and the encode is very weak generally speaking. This is not to say that for the regular punter this set will not satisfy. It’s a step up on DVD with sold, bold, even warm colours, decent contrast and black levels aren’t bad either being deep and satisfying although there is crush evident in scenes set in dark rooms or at night. Picture junkies will however not be impressed because this set isn’t showing us the series to the same standard as other HD material from the era on Blu-ray like Star Trek: The Next Generation, Twin Peaks or The X-Files. The image isn’t even as good as the more recent Quantum Leap release from the same company. If these episodes are being viewed on bigger, correctly setup televisions (sat 60 inches or more) with all artificial enhancements switched off then the issues I highlighted above will be more evident and if projected then the bigger the image the greater the magnification the greater the problem. I viewed on a 58 inch 4K TV from a distance of ten feet and the image was generally acceptable if not as good as other Fabulous TV sets. Disappointingly like their release of Quantum Leap, Fabulous Films gives us a lossy Dolby Digital 2.0 Stereo track that faithfully recreates the Dolby Surround track from the original broadcasts. Dialogue is front and centre with effects and music moving around the sound field accordingly when played through Prologic II. If you don’t play through Prologic II all sound is confined to the front with dialogue front and centre and effects and music channelled left and right. Being a TV soundtrack from 1990-95 don’t expect a feature-film level sound experience and being lossy it’s a step down again. On a 2018 Blu-ray release I’d expect a full, lossless LPCM 2.0 Stereo or DTS-HD Master Audio track 2.0 Stereo. Disappointing in the extreme. There are no subtitles so for the hearing impaired fans out there you’re out of luck, alas. Surely the HoH subtitle tracks from the DVDs could’ve been included? Extras have been culled from the old DVD sets but as you can see in the DVD listing below much is missing. Season 1 has lost all 115 minutes of it’s extras and we get nothing on this Blu-ray. Season 4 seems to gain some material over the DVD and season 6 is the same as the DVD. But you can’t argue with the totals: 441 minutes on the DVDs versus 270 minutes on the new Blu-ray set from Fabulous Films. All of the extras are in standard definition and are not presented in a finished state so the image suffers from being soft, with poor detail and plenty of black crush. However, there is plenty of entertainment value to be had in this material. Fans however, deserved to get the whole enchilada and have ALL of the material ported across; purists will want to keep their DVD sets as a result which will take up unnecessary shelf space. Having seen some of this series when it debuted on UK TV back in the day I feel that although it’s not normally the kind of show I would watch regularly that I can say that it is a solid, entertaining production and if it’s your bag then it can’t be beat. The Blu-ray set from Fabulous - a world premiere - is sadly a costly disappointment with softy, aging transfers and an indifferent (at best) encode meaning that if viewed on big screen TVs or via a projector, then artefacts will be visible and in darker scenes especially. Although the extras package is decent by most TV on Blu-ray standards it’s mystifying as to why 171 minutes worth of material previously available on the R1 DVD sets isn’t here. A step up in quality from the DVDs but not as big a leap as I would’ve hoped for. A classic series that’s fondly remembered by many given disappointing video, audio and extras. I hate to say it, but given the preorder prices (£149.99 on UK Amazon) I’d wait for serious reductions.